This dish was inspired by the Italian mezze platter, but has a true South African and Cape Malay twist. I replaced the Parma ham with springbok carpaccio, and added roasted nuts with fragrant Cape Malay spices. I also used three types of melon instead of one to add diversity to the dish. Most of the ingredients used are prepared in a modest manner to retain their natural flavours. 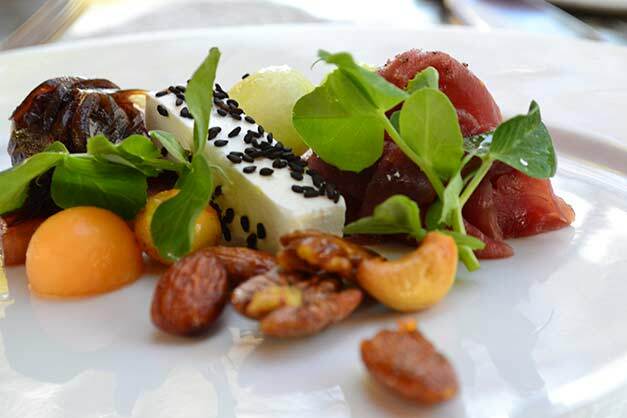 The combination of the sweetness of the melon, the fragrant nuts, the subtle smokey carpaccio, the salty Danish feta and the delicate asparagus is not only a treat for the taste buds, but also a feast for the eyes. This is one of my personal favourites as we head into the sunny season, as it is delicious, light and beautiful. This dish is best served on a hot summer’s day with a glass of Sauvignon Blanc.